Leather at its most deceptive. Leather is all around us; our shoes, sofas and jackets are all constructed from it, but we often overlook it because of the too familiar form it generally takes. Yet, this excellently curated exhibition at the Bluecoat Display Centre moves leather into another realm, enabling us to look at the medium with fresh eyes. This is leather – not as we know it. There is something uniquely visceral about leather as a material; it creaks, it bends, it is supple and mutable, and while it may be the hide of a dead animal it continues its life as an organic form. The artists displayed at this exhibition have all taken the medium and run with it, to re-fashion it into wearable, functional, experimental and decorative art with a difference. For instance, the sculptured jewellery of Hyorim Lee depicts the fluidity of nature through delicate flowers, grass and trees, while Tania Clarke-Hall produces jewellery you would never imagine was made from leather due to her use of a simple and straight geometric economy of line and bright flashes of colour. This is leather at its most deceptive. In addition, Lisa Farmer’s experimental sculptural works are beautiful labour intensive pieces worked around iconic glass vessels from which the hide blends agelessly and so seamlessly that you imagine her art is both contemporary and yet equally a piece that time forgot. There are few aromas I count as my personal favourites, these include; beeswaxed wood, the peaty undertones of Islay malt whisky and the fresh intense pungency of new leather. There is something decadent, rich, luxurious, and innately satisfying about these quality olfactory experiences and these sensory perceptions have certainly tipped over into the tactile work of Harry Owen. Owen produces bags that are constructed with such precision of craftsmanship you feel an overwhelming desire to want to pick them up and touch, feel and smell them, not just wear them. What makes these works cross over into the world of art, is that every piece from all of the artists on show become much more than functional items. Similarly, the body-art from Una Burke oozes a sensuality and sexuality that other mediums can rarely capture, and it’s this approach that makes them luxury statement pieces beyond the norm. These artists show the versatility of a medium that we have taken for granted for far too long. Therefore, if you are feeling lacklustre about leather, this exhibition will reinvigorate your opinion in more ways than one. 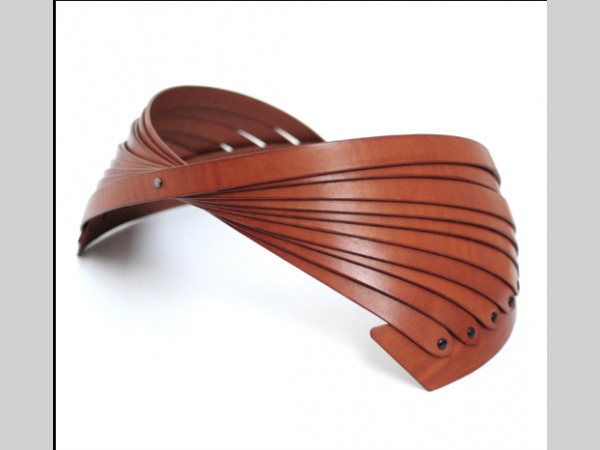 L for Leather is on display at Bluecoat Display Centre, Saturday 4th June 2016 – Saturday 2nd July 2016.